Yesterday was a great day. 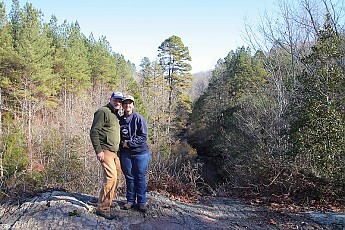 My wife and I did a little exploring down in Uwharrie. 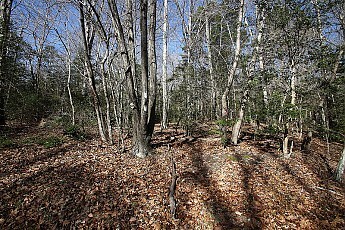 The Land Conservation Trust of Central NC and many volunteers have been working on regaining the 20 miles or so of Uwharrie trail that was lost due to private land concerns. Recently a 4.5 mile section of trail has been opened (officially opens 12/8/2013). We headed down to the new section on Thayer Road. Taking a leisurely round about sight-seeing route, we found some interesting sites in Randolph and Montgomery counties. I have always avoided hiking the missing sections due to private land traverses and the hassle of permission and access etc. These sections have always been on my mind in hopes of hiking them legitimately some day. It is very exciting to see this section open. I hope that next year I can help in the construction of another new section to complete the restoration of the full length UT. The UT is a very special trail because it is in Central NC, and is the longest continuous trail through the only national forest in this part of the state. The UT also show cases interesting geology, habitat and history. The new section starts on Thayer Road and ends at the Jumping Off Rock trailhead. 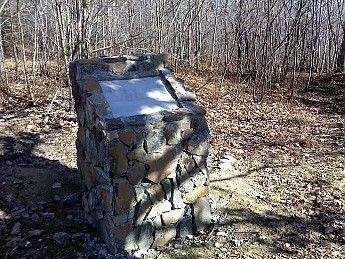 Volunteers have installed a nice commemorative plaque stand to honor Joe Moffitt the person who built the original trail back in the 1970's. I met him once, unannounced, I came knocking on his door and he graciously invited me in and we had a great conversation about the trail, the area history and how the trail came to be. I hope he will be at the ceremony on the 8th. 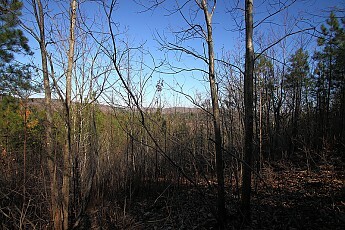 The trail begins next to a gated road, and shortly crosses the road, heads uphill through a recent clear cut, mostly dense hardwood saplings and brush. You will pass some cairns before you reach an interesting quartz boulder field at the rim of a gully. You then continue to climb up a nicely cut, finished and graded trail past scenic ridges (not easily visible in summer I'm certain). 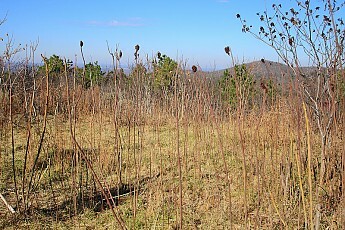 About 1/2 to 3/4 mile in you reach the beautiful grassy summit of Little Long Mountain. Little Long Mountain is known locally as Bald Mountain, and is about 900 feet in elevation from about 720 feet at the trail head. From the summit you have some very nice potential campsites and a true 360 degree view. I can’t wait to hike the newly restored UT soon! I will probably brave the hunters and get up to the Little Long summit on my traditional New Year’s Day hike and hopefully camp out and do some stargazing. Jumping Off Rock with my wife and sportin my Trailspace hat! The trail crosses Anthill Road here. The summit of Little Long Mountain is quite nice. Scenic winter views on the climb up to Little Long Mountain. A commemorative plaque will be installed here in honor of Joe Moffitt. Dig it Joe. super nice to get out with the wife, isn't it? Yes, we had a great day. I was actually suprised when she said that she wanted to go with me. All forums: Older: To Walk the World Newer: Loop trails in Maine?